Top of the morning to you! 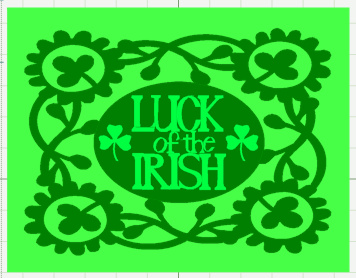 This week's theme for Sweet Treats Thursday at the Cuttlebug Challenge Blogspot is all things green for St. Patrick's Day. Be sure to visit to see all of the great projects the Design Team has created and then visit their individual blogs for full details. 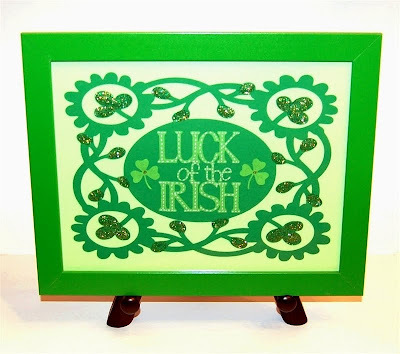 My first project was this framed "Luck of the Irish" to decorate for the holiday. Above you can see the preview in Design Studio. You will need the Storybook and the A Child's Year cartridges to duplicate the design. I used George for the oval that is welded in the center of the image but this can be changed if you don't have George. To make things a bit easier for you, I have added an oval from Plantin Schoolbook on the last page of the file. If you don't have George, select the oval and copy it. 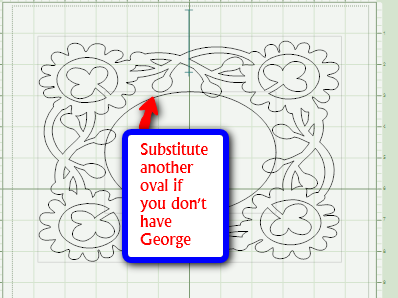 Then click the tab marked CUT for the frame, delete the George oval and paste in the oval from Plantin. The weld box is already checked on the Plantin Oval so your file should cut properly. If you do not have George or Plantin, you can use another oval from a cartridge you do own. Start with a vertical oval and adjust the values in the Shape Properties box as shown above. Be sure to check weld for the oval. 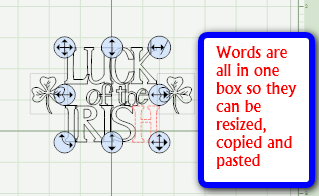 There is a separate preview page showing the words and two shamrocks. Do not cut from this page - the weld is not checked so the color will show for a preview. The words are created in one selection box so they can be copied and pasted as a group. You can also alter the size if you want to use the words for another project. Be sure to check weld if you copy the group from this page to use in another project. On the page labeled CUT, I added four more shamrocks to make the best use of my paper. 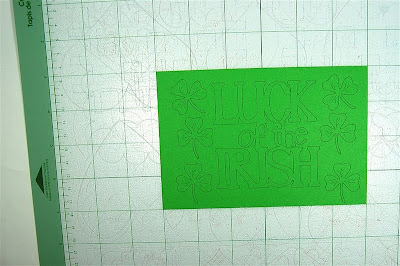 The postion of the paper is marked on the tab - you need a 4 x 6 inch piece of paper placed at 3 inches down and in (X-3, Y-3) to cut the words and shamrocks. Here is a photo of the 4 x 6 paper on the mat. 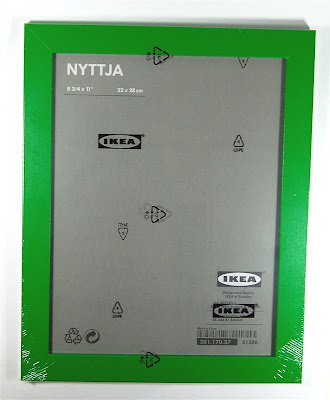 I used an inexpensive frame from Ikea for this project - I purchased several red and green frames at Christmas time knowing that they would be handy at other times of the year. I used several shades of green paper (it is amazing how many I had and how tricky it was to find the right combination of three!). Here is my trial layout before adding the white pen stitching and the Stickles in Lime Green. 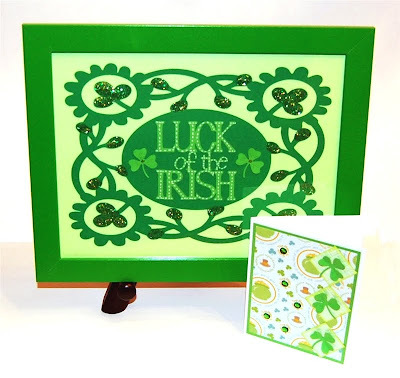 Here is one more view of the finished piece in the frame along with the card I made with a few of the extra shamrocks. You can download the .cut file at this link. 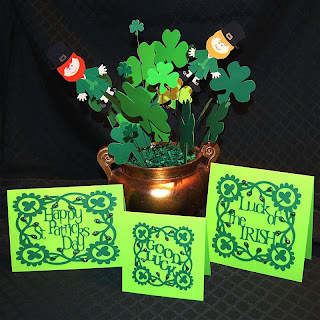 The "leftovers" card was made with some pieces of the same cardstock and the extra shamrocks. The patterned paper is from a DCWV Spring stack from a couple of years ago. I cut the light green squares at 1 1/4 inches and inked the edges. 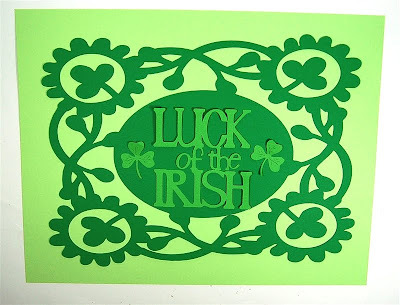 They are embossed with one of the Oh My Crafts exclusive Cuttlebug folders in a brick pattern ( I think I had "Over the Rainbow" and the yellow brick road mixed up in my mind with the pot of gold at the end of the rainbow!). I attached the shamrocks with glue dots and bent up the leaves a bit, creasing them at the centers. 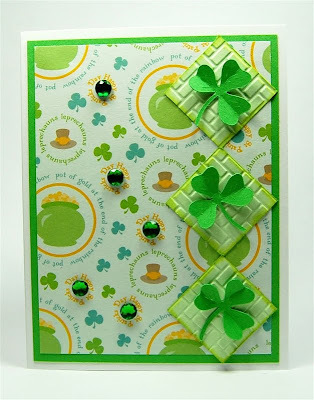 The patterned paper had small circles with the words "Happy St. Patrick's Day" surrounding them so I added a bright green gem in the center of each circle. I made this centerpiece last year and I thought that some of my current readers would not have seen it. There are several files to help you create your own. 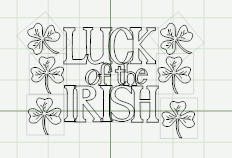 I set up files for the little leprechauns at four inches with all of the sizes and paper placement worked out for you. 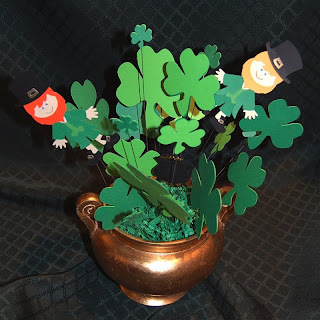 The leprechauns and the shamrocks in the bouquet are from the Paper Doll Dress Up cartridge. There are also several card toppers. The "Good Luck" is an adjustable file and can be resized to fit a full 12 x 12 page. The posts for the various cards, the leprechauns and the center piece are all from March of last year from March 11 to March 15. Here is a LINK to the posts from last March - you can scroll down until you find the ones you are interested in. To get directly to the page that has these posts click "older posts" twice. 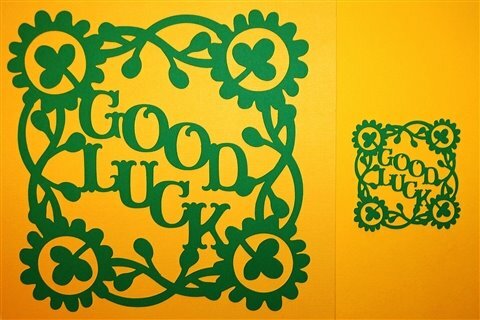 I hope you enjoy these and that you have a Happy St. Patrick's Day! How cool! I think I resized it all to work on a 12x6 mat. Can't wait to try it out. Very Nice Card. Love the centerpiece and with the last name of McShea.... You know I enjoyed it! Fun fun! I'm inspired to give these a try. Thank you! Great card and use of ds.